Ah, the joys of youth! While I was trying to recover last Sunday afternoon from the Upstate Winter Bicycle League on Saturday, Strad and his friends were heading up to Caesars Head. That put those guys over 160 challenging miles in the two days. I probably could have done it, but I would have been in bed for two days! Strad and Blair are junior riders for the Ultimate/Carolina Cyclone team and Danny and Alder ride for the Hot Tubes development team. Yes, the joys of youth. It is true that as you get older you can do about what you could do when you were younger -- it just takes longer to get over it! I find that to be pretty true. However, the great thing about cycling is that it is a sport for life. I've seen too many "older" people who are climbing Mount Mitchell and toasting me during the Hour of Power. I figure I've got lots of years to enjoy -- even if I did get a late start. I realize I haven't posted anything in a few days. The thing is writing posts about riding my trainer isn't much fun. That's what I've been up to. An hour plus on Monday and Tuesday. Probably won't be able to get on the road until tomorrow... I hope. Still, there is stuff going on over at the GreenvilleOnline.com blog. Actually, I'm starting to get more fluffy stories than I have days to post. I might double up on some post, but I try not to do that if I can help it. Check it out, if you haven't already. I didn't report on my Upstate Winter Bicycle League ride yesterday. The first order of business was trying to raise myself from the dead! Then it was off to the Monster Truck Jam at the BiLo Center with Thing 2 and Thing 3. Once I got home from that, I dragged myself into bed. Downtown was a busy place that morning when I rolled up. The 31st annual Greenville News Run Downtown 5K was taking place causing me to alter my route to get to the starting point for the ride. I was told 2200 people had registered. Judging from the number of people I saw, they must have all showed up. I hooked up with some of my Hour of Power buddies while we waited for things to get underway. Unfortunately, for me, they were taking the 60 mile route. That meant not as much company for the pain to follow. On Friday I had talked with Strad and John at the shop and told them I was going to hold back and try to finish this one with the main group. John told me that was a smart move, but "if I know you, your ego is going to kick in and you're going to go for something." I was determined not to. I was being really good up through the first 20 miles. After the potty break, I ended up near the front. I decided at that point to see what would happen if I pushed it a bit. I started to pull aiming for a spot about 200 yards ahead. I should have pulled off earlier. I was going about 19 mph and had the feeling I was slowing the group. So, I kept pushing a little more. My HR hit 188 and I knew I would have to bail. I did and fell back like a rock! I was trying to recover and ended up falling off the back. Evil thoughts came into my mind, "You're feeling the way you felt at the end of previous rides -- and you are only 30 miles in! How are you going to survive for 60 more miles!" Thankfully, we came up to a stop sign which slowed the group and I was able to catch back on. By the time we got to the first attack zone about 43 miles in, I was back into shape. John would be proud of me. I stayed in the group and kept the leaders in sight, but stayed well within myself. As we finished the first sprint, I felt great and even better was the fact that the store stop was right afterwards. During the stop, I pulled over to the side of the store to lean my bike against the wall. I changed over my colder gear and put on some drier gloves and stuff. I was ready to go! We started off and immediately I knew something was wrong. I couldn't get clicked in. My Speedplay system was messed up. I looked down and noticed that my shoes were full of mud. I finally got the left one in, but the right one just seemed impossible to get in. Finally, I pulled off to the side of the road to fix it in hopes that the SAG could bring me back to the group. Unfortunately, the left foot was hung. I couldn't get it out. Down I went right on my left hip. I had to fight to get my left foot loose. Finally, I thought I had enough mud out and got back on to catch the group. No sooner had I started than I realized that it still wouldn't go in. Thankfully, the left foot wasn't stuck anymore. I kept working on it toward the rear of the group -- pouring water on it and banging it against the pedal. Ah! I got it in -- though it was stuck there for the rest of the ride. Not long afterwards, we started the second attack zone. Again, I stayed back, but this time the zone was longer and even though I was trying not to stay up at the front, I started to fade. Thankfully, I was with a few other riders as we came to the next turn. I took the turn before the group returned from the sprint line. I rode on for several miles getting myself back into shape. The group gobbled me up and we carried on without any events until we started the last attack. No way was I going to be able to contest it, but I hoped to stay with the main group. The horn blew and we started off. I felt great at first because the group didn't seem interested in pushing it. A rider went off the front and then another. The group let them go. Then a third rider bridged over to those riders. The group let them go. It wasn't much longer that we hit a grade that slowed the riders in front and they were swallowed up. I don't know what happened after that. Things started picking up at that point and I started feeling a cramp coming in my left leg. I lost the group shortly before we reached the turn onto I20. I started spinning and sent happy thoughts to my muscle. Just as I turned to go on the four lane road, the SAG came up. I was with a group of about 4 riders. Some of us hoped on the back of the draft. That brought us up to a group of about 10 riders. I bailed at that point to continue on in with those riders. I couldn't complain too much. Really this was the best finish I've had yet. As we were heading down Augusta Street, I ended up beside Steve Sperry. I told him how much I enjoyed his choice of roads for the today's ride. He saw I had a Garmin and started talking about the elevation of this ride. He mentioned that he hadn't been riding enough and today was a really bad day for him. I joked, "Well, it is good to have you come back to visit with us for a bit." He replied, "No offense, but I really don't want to be back here." I came back, "Me either." Just because some of us are in the back doesn't mean we enjoy being back there. We can be just as competitive as the guys up front, we just haven't had the experience or the training to be there. Over all, I'd say it was okay. I feel like something wasn't right. I knew right off that I didn't have it. Had George and Craig been there pushing the pace, I probably would have been spit out the back. Hey, even King Sperry has a bad day every now and then. I got my CycleOps fixed on Tuesday. I didn't get to use it though because of late evening meeting that had me ready to hit the sack. I didn't use it again today because I was able to ride my bike! The plan to was to repeat the ill fated attempt to do a Paris Mountain over and back. When I tried that last week, I had two flats on the way up the mountain. Thankfully, I went right past that spot this time without a problem. I was dressed for temperatures in the mid to high 40s. My arms were a little cool beneath my long sleeve jersey as I started out. I knew as soon as I warmed up that wouldn't be a problem. By the time I was climbing Piney Mountain Road, I was plenty warm. The goal was to complete what I had hoped to do last time - go over the mountain in my big ring and then come up the other side focusing on my heart rate. The climb from the State Park side of the mountain was uneventful. A couple of times early I hit a heart rate of 185 bpm, but I was able to quickly bring that down. Once I got over I ate a Clif Bar and then started up. The time covered when I left my house to the KOM was 34'30". I took it easy coming down the Furman side because there was still snow and some of it was melting and spreading water on the asphalt. Things were cold up there and I sure didn't want to hit a patch of ice! I had come this far in my big ring, so I thought I would try coming up this side that way. My goal was not to push it and ride until my heart rate hit 180 bpm. At that point I would shift to an easier gear. I started up at an easy 7 mph or so. Once I got past the water tower, I actually picked up some speed. When I reached the halfway point, I was surprised how well I felt. I knew it would start hurting soon, so I didn't get too elated! Still, I stayed in the big ring and actually started to push it so that my heart rate would go up! I was tired of the big ring and wanted to down shift. At one point I rode for what seemed like eternity with my HR at 179 bpm. Finally, it hit 180 bpm right as I came into sight of the 15 mph sign near the wall. From there I didn't push it too hard and ended up coming over the line in 14'14". I felt pretty good about that. Had I used proper gearing and pushed it a bit, I have no doubt that even in the cold I could have gotten at 13'30". Speaking of cold. It was cold! When I got home it was 41 degrees. I'm sure it was at least 4 degrees less up 1000 feet higher. The worse thing of all was the ride down to State Park Road. The wind made it seem even colder. I didn't have shoe covers and I was wearing some cool weather gloves. The only thing I could feel about my toes was a dull ache. As I attempted to get my shoes back in the pedals when the light changed, I couldn't feel if I had them properly lined up. My feet slipped off a couple of times before I got them secure. By the time I got home I limped in with sore toes and fingers. It took a while before they felt comfortable again. Still, cold or no cold, it felt so good to actually ride my bike. Things have not been good lately. I have had less time on a bike in the last two weeks than anytime I can remember in the last year or so. Weather, equipment, and (mainly) time have conspired against me to force me into a mid-January break. When the weather and time begins to keep me off the road, I have turned to my CycleOps trainer to save the day. Unfortunately, my trainer broke about three weeks ago. At first it didn't bother me because I was able to get some miles in outdoors. The next week after that, I just hung on while I went about getting a new one. Now, I am still waiting. I called today to see if it had come in, but forgot that the mail (it was shipped USPS) didn't run because it is MLK Day. This sent me down to the basement to figure out someway to get that thing up and running again! The problem is with a yellow handle - that you can see in the picture above. Turns out I'm not the first person to have this thing break and there is actually an upgrade you can purchase for about 20 bucks. Thanks to Stephen for sharing in my misery and sending me the link. The handle is used like the handle-cam on your quick release skewer. Once you get an amount of tension, you lock down the handle and it adds that little extra and then locks down. The problem is that it is plastic and the forces applied on it cause it to fail. So, what I have done is tighten the threads down as far as I can and then shoved an old stylus from a hand held computer into the remaining gap. Not perfect, but it does give me enough tension that I think I can get a reasonable spinning session in. Hopefully tomorrow the real deal with arrive. I'll put it on and I'm sure it will break after some time. Then I'll just get one of those upgrade kits. Don't get me wrong. I have loved my trainer. It is fluid and solid. I've done some pretty all out sprints on that thing and it has held my bike firm. My only beef is with the poorly designed handle. 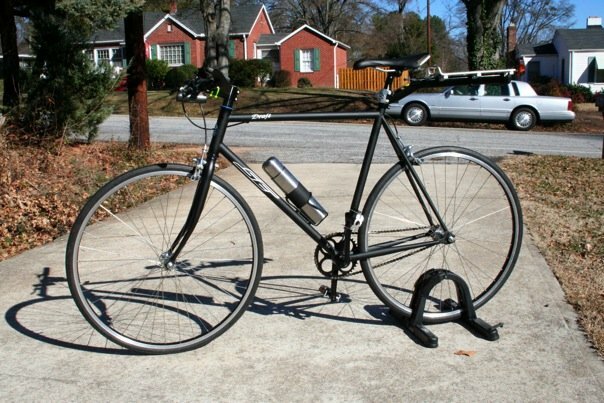 Over at the GreenvilleOnline.com Cycling Blog I told the story of my incident last night when I blew two tires in the space of 15 minutes. It lead me to rethink some of the things I carry in my saddle bag. I thought it might be a neat thing to show a picture of the items I carry with me. Am I missing something? Any ideas of some ways to save weight or space? I have a pretty small Specialized bag that hangs beneath my seat. All this stuff fits snugly inside. The weight is just over a pound. We had snow yesterday. It was very pretty when we got up that morning. The kids were stoked! They had a blast making snow men and sledding around in the neighborhood. The only negative thing is that someone must have slid off the road in the front of our house and nailed our mailbox. I didn't get out in it much since I didn't get home from work until after six. Would have loved to have played with the kids some, but I have to settle for looking at the pictures and video. I love putting numerical titles on my blog. Normally it means that something good has happened. Well, this time it's because I now have my Assault on Mount Mitchell rider's number. Ok, go ahead and laugh at me for making such a big deal of this. You have to understand what getting that number means to me. Before I ever started riding my road bike, I was aware of this century that seemed like an epic feat to me. When I first started riding in 2006 I still thought the mountain ride was beyond me. Then I started reading accounts of people who had made the ride and talked with those who made it to the top. By the time of the 2007 Assault, I started to realize that it was certainly possible. I started making my plans to do the ride in 2008 at that time. I finished the Assault on Marion in 3'45" and watched the Mitchell riders keep going on their way. At that time I knew I could make it. I'll be 40 by that time and the ride will be a great birthday accomplishment. So there's several reasons why this number means a lot to me. Let's go! I like it. What happens now is that the pass code comes to me and I go to the Active.com site and register for the ride using the code. My assumption is that this early in the game, I shouldn't have a problem getting one. Hopefully, my planning will pay off. A lot of thought went behind this gift. It took a while for my wife to find what she was looking for. Finally she found a set online from a company in England. There was an omen before the Upstate Winter Bicycle League this morning. I forgot my helmet. I got out of the truck, got my bike off the rack, and realized my helmet was back at home! To make matters worse, I knew I wouldn't be able to get in the house if I went home because the beautiful red head was taking Things 1, 2, and 3 to Thing 1's piano guild. (She did very well, by the way. I watched the video.) The door would be locked. Thankfully, the folks at Carolina Triathlon let me use a helmet for demo rides. I got it on without anyone getting on my case for riding my bike from the truck without one. Today's ride was to be a 95 miler. My Garmin showed that it was more like 92. There would be three attack zones and sprints. Ooooo, it was going to be a tough one. The beginning was the same old same old -- except we started going in reverse. No, not our bikes, but the route. I had hoped that things would be pretty close to last week so I could know more what to expect. We eased into a nice pace and I was able to achieve one of my goals I had set for the day -- take some time to talk to riders around me. I saw Craig Lewis and said hello. Then I spent a good amount of time talking with Dave from Charleston. He is one of the organizers of the Lowcountry races coming up in the Spring. We had just finished our conversation when we neared the first attack zone. It started right after a stop at an intersection about 35 miles in. I was right up there in the top 12 or so. The whistle blew and we took off. George and Craig were up there with Sperry, Andy Baker and some other really good riders. I didn't know much about the other riders in the group. All I really needed to know was who would be up front. A silly grin crossed my face as we started. I decided to see what it would be like to mix it up with these guys. We were flying! It was pretty flat and we were well over 30 mph. I was right behind a guy in a Furman kit. I just hooked on his wheel and followed -- looking at his wheel. When I looked up, I noticed a gap had formed between the Furman rider and the group of 8 before us! I went around the slowing rider and actually started to close the gap. I then looked down at my Garmin and saw my heart rate was at 191 and would keep going if I kept this up. 196 is my max. It was time to slow down. I took my time and allowed some riders to pass me while I got myself back together. It didn't take too long so I got back in line and was able to close up to the lead group in time to see the leaders cross the line up ahead of me. A BMW girl was right in front of me and I just had to pick it up and pass her before we reached the marker. The good news is that within a minute of finishing the sprint my heart rate was down to the low 140's. The pace went down some and by the time we reached the next attack zone, I was feeling pretty good. The attack zone was going to be a climb above Ware Shoals. I was actually looking forward to it because climbing steep grades seems to be one of my strengths (relatively speaking). Unfortunately, I was toward the back as the attack started and half the group -- those who didn't want to climb -- turned left to go into the town. I had to slow to get around them and the leaders were nearly 30 yards away. I decided just to see how many I could pass on the way up. My reckoning put me passing at least 12 riders. I rode in to the store stop leading the second group. Lots of good things happened in that first half. I was through the first 52 miles and had made it through the first two attack zones. There would be only one more at the very end. Surely I would have a better second half this time. Things started out pretty good. Unfortunately, around mile 72 we came to an unfamiliar stretch. We had just turned from a stop sign and I got caught flat footed. I was dropped from the main group before I knew what was going on. I tried to catch back on, but this was when I started to feel the same weakness as last week. It got so bad that I had to do a mile or so behind the broom wagon drafting back up to the main group. From that point up until the last attack zone, I was riding along just fine. There were even a number of grades where I climbed with no problem. Going into that last attack zone, I just pulled over and let them go. I tried to stay in a secondary group so that I could come in with a respectable finish. It didn't happen. Just as I was about to turn onto Piedmont Highway the broom wagon caught me again. I waved her on. Drafting off the broom wagon is adding insult to injury. I decided to just enjoy the day and ride in at my own pace. Turns out I wasn't the only one. Two other riders came up behind me and we paced together for awhile. As we got closer to downtown, I started feeling better and I picked up my pace. Up ahead I could see a rider in a yellow and black kit. I guessed it was Stradford Helms. What was he doing back here? I caught him and we rode in together. It turns out he broke a shifting cable and was stuck in his small front ring and his 14 ring in the rear. I think he basically spun himself to death for the last 30 miles! I finished the 92 miles in 4'33" averaging 20.2 mph. We had just under 5000 feet of climbing. I burned 5800 calories and averaged 158 bpm HR. There just seems to be something about the 70 mile mark where I hit a wall or something. It is the same thing as before. It isn't that I am in a bunch of pain or anything. I pedal and still watch the group slowly ride away. Once there is a gap, I have to work that much harder to close it up again. That puts me deeper in the hole. It has to be that I am fooling myself on the way out. Once again the elevation chart shows a downhill ride in the first half. The second half is uphill. These long sections with speeds over 25 mph up a 2% grade are the ones that get me. I just don't know what I need to do to improve it. Oh well, next week I'm going to go back to my Sunshine Cycle Shop ride. We climb nearly as much, but it is in a 28 mile ride. I don't think George will be there pushing the pace either! 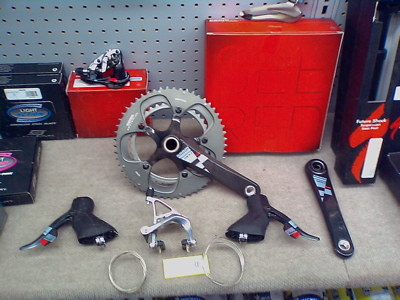 I was a bull in a cycle shop yesterday seeing Red. When I stopped by Sunshine Cycle Shop to get a adjustment to my trainer bike, I was casing out the pedal systems to decide what to get for my wife. While looking in the case I noticed the full group of SRAM Red components in the display. Nice. Though I have to admit I'm not as drawn to it now that I see it than I was back when you couldn't get your hands on the things. Really, is any difference worth the nearly $2000 price tag? Now, the SRAM Force or Rival does interest me. The shifting is so clean and yes, the look is pretty nice as well. All in all I am reminded again how much ego plays into component choice. Really, you have to be at a pretty high level before such minute changes in weight, etc. begin to make a difference. I'm not at that level... in performance or bank account! It still remains that the best changes you can make for your riding are with the human component. Yes, going from a 30 pound bike to an 18 pound one can make a huge difference. Going from a Shimano 105 group to a SRAM Red doesn't. Sure makes you look fast, though! This morning my pastor spoke from the passage Hebrews 12:1 and 2. "Therefore, since we are surrounded by so great a cloud of witnesses, let us also lay aside every weight, and sin which clings so closely, and let us run with endurance the race that is set before us, looking to Jesus, the founder and perfecter of our faith, who for the joy that was set before him endured the cross, despising the shame, and is seated at the right hand of the throne of God." He drew from his personal experience participating in his first Cooper River Bridge Run. I couldn't help but think of my ride yesterday. So many of the points he was making fit with the struggles I was having. It made the application to my real life much more effective. Anyway, it gave me a boost in my spirit - not just in everyday life, but also with my outlook on riding. Even if I'm never the guy who is winning the sprints or putting a hurt on those around me, I can use the activity to help me grow in endurance. For certain the lessons learned in the physical discipline of riding can be turned to be applied to other areas of life. Once I got home I decided to hop on my single speed and ride it over to my in-laws where we were going to have lunch today. I threw on some baggy shorts, a long sleeved jersey, and my helmet. Then I was off. I needed to ride for at least 30 minutes to reach my exercise goal for the day. It typically only takes 15 minutes to make the trip. I decided to do some laps in Cleveland Park to make up the difference. As I came into the park, I could see two guys in full cold weather gear on road bikes heading up Woodland Way. A devilish thought came to my mind. Why don't I just climb up after them and follow them for a lap or two? I caught them about halfway up and just settled in behind them. As we climbed up Woodland Circle I passed the second guy and continued along between them onto Richland Way. The front guy picked up his pace and we were going along at 27 mph. 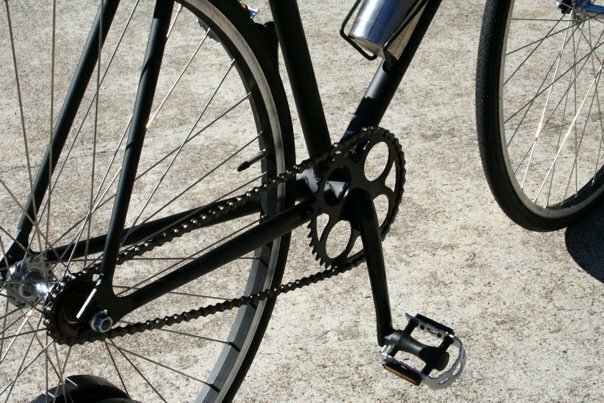 Now, that might not seem like much, but on a single speed that is just crazy! I was spinning so much I was afraid my feet were going to come off the pedals. I had more to give, but I just couldn't turn the pedals fast enough to keep up with the guy. He finally left me as we passed the memorial. I eased up and the guy behind me came around me as we reached the tennis courts. They rode away from me for a little bit, but I caught them again as we climbed up Woodland Way for the second time. I wasn't going to let them go. Finally, one of the guys looked around at me and said, "How's it going?" "Great," I replied, "I'm just getting in some single speed action." It was at that point he looked down to see the gearing (or lack thereof) on my bike. It was worth it to see the look on his face. At that point, I went up front and I think they turned off before we got to Woodland Circle for the second time. I went ahead and finished that lap and headed on to the in-laws. Now, that was fun. Any down feelings from yesterday were gone. Actually, viewed through the lens of today... yesterday is looking better all the time. Yesterday I tried to decide if I would do the Sunshine Cycle Shop ride or the Upstate Winter Bicycle League ride. After stopping into the shop to have some adjustments made to my Draft, I got the impression that there wouldn't be a lot of riders out for the shop ride. I decided on the UWBL. This time I wasn't rushing around at the last second to get there. I arrived in plenty of time to get signed in and see if there were any other riders I could connect with on the ride. Barry and Owen were there, but they were going to ride in the shorter distance group. Jimmy Helms was there and I spoke with him a bit. He said he was going to ride in the fast group, but he would probably climb into the truck the Cyclone coach would be driving. There were a few Cyclone riders and alums there. So, I was left kind of to ride alone. After some announcements I rolled off with the group. This time I determined I was going to get closer to the front. The last time I did this I spent more time braking then pedaling. It worked out great. I was up in the top ten about ten miles out. I stayed there up to about 20 miles. Then we came to a stop sign. Just about that time, it was my turn to pull. So, after we crossed the intersection I pulled for a bit. Then I went back to about 20th. It was nice up front. You could get on someone's wheel and pretty much not worry about having to brake or take evasive action. From the front row back to about 12th, everyone was riding two-by-two. As we neared Ware Shoals, it was time for the first sprint. The attack zone was about five miles. This was all new to me the last time I rode this ride. I have never experienced riding in attack zones so long. This time, I was going to play it smart and just stay with the front pack and see what would happen. I was moving along pretty well. We were over 30 mph and I found myself on the wheel of George Hincapie who was along for the ride. I was feeling good and went to give myself some more gear... there wasn't any. I had as much as I was going to get. I looked down at George's wheel. He still had about four gears to give! Ha, it was pretty obvious he could crush anyone out there should he decide to give it a serious try. A little later in the attack zone I found myself overlapping the wheel of the rider in front of me. He decided to move across me and I had to brake and move to avoid getting clipped. I know it didn't make the guys behind me very happy, but they would have been less happy had I gone down and taken them out! I regrouped and just rode along checking out the action in front of me. I had no idea where the line was. I couldn't have any strategy. My idea was just to stay close to the guys in the team kits cause I figured they would be the ones going for points. I looked up while in about 15th place and noticed a marker for the Ware Shoals city limit. That was the line. It was really too late for me to react and some riders got around me. I crossed the line in about 19th. At least I felt that had I tried to go for the thing, I could have gotten 10th. I was certainly in position and had the legs to do so. From there it wasn't too eventful. We did our stop there at a station and then we headed out again. I had never been to Ware Shoals. There appears to be a cool park there I'd like to go back to sometime. Coming out of Ware Shoals we started a climb. I moved my way up into about sixth place. Once again, I found climbing to be where I could move up. It wasn't like I was trying to race or anything, it was just that my comfortable cadence was taking me around some riders who would slow on climbs. The road was rough! The whole bike was shaking as we climbed. Then it started feeling really rugged. I heard someone behind me say, "You've got a flat." I looked down and sure enough, my rear tire was down. I think it was the extra light Michelin tubes that I was giving a try to do a review on for my GreenvilleOnline.com cycling blog. Not sure they are going to get a very good one! I had the rear wheel off by the time the SAG got to me. Cindy pulled over and opened the minivan door. I climbed in and started to change out my tube. It was interesting going around the turns while trying to fix the flat. I got it done though and was ready to get back at it. You would think it would be nice to take a break and have a ride in the van while the others are pedaling away. Not so. When I got out I was stiff and my energy was way low. Of course, I was put out behind the group and had to catch up. So, Cindy let me draft off the back of the van until we caught back up. From up front in sixth place to dead last with dead legs. I never felt right after that. I did work my way back to the front -- which didn't help matters either. Just as I was reaching back into the front 20 or so, we had to do a U-turn because we missed a road. I was able to turn around and get up on the front. I stayed up there for awhile. Then I pulled over to let fall back into the group. I was about 15th when we turned onto the road where there is normally an attack zone. Today it was inactive but still the pace picked up. Hincapie and his posse seemed to be wanting to sprint even when they didn't have to! I hung on for a bit and then realized how stupid I was being. I eased off but I could tell that things were probably going to go south from here. My confidence was high and was sure the ride wouldn't kill me. At that point, finishing outside the main pack wasn't crossing my mind. Once again we just rode along after the unofficial sprint ended. Nothing really to write about until we reached the final attack zone. Hey, can we just end this post now? Hincapie and his group was right up front again. I was right behind them. The ride leader - who was next to George - said, "Now we blow the whistle." I said, "The whistle means 'stop', right?" "Riiight," he replied. Off we went. I knew this was going to be a LONG attack zone. I let the group in front of me get away and just decided to hang with the mere mortals who were coming up behind me. My heart rate was around 160, but I was feeling some lactic build up in my legs. It was weird. I was breathing just fine. My heart rate was great. My legs were not cramping or really hurting that badly. They just wouldn't push without me summoning a great effort. With about 15 miles to go, negative thoughts started attacking my mind. "Oh, I just want to stop," the black angel said. "Don't stop idiot. It is going to be a lot harder to do it by yourself!" said the white angel. "Man, this is embarrassing!" was the primary thought. After the flat and working my way up toward the front again, a Ryobi dude (that is what I call them) came by and said, "You're having a really good ride." That felt really good. Now I was hoping he was up there with George and didn't see me dropping off the back. "Okay, we'll use this as a character building exercise," I told myself. "Don't quit. You can come in dead last, but don't stop trying to finish pushing strong." I really did try. It helped that the broom wagon came by and allowed those of us falling off the back to draft. I suffered until we made the turn onto Augusta Road. Once at Church Street, we had to stop for a light. At that point I seemed to recuperate and I left the group I was with behind and rode in alone. Hey, 85 miles with two attack zones. The more I think about it, the less bad I feel about it. I stayed at the front most of the day and I really think that if I didn't have that flat, I would have been able to finish a lot better. No way would I have kept up with that last sprint group, but I think I could have stayed near the back of the main pack. Sorry for the long posting... but it was a long ride! Here are some more pictures of my SE Bikes Draft single speed. Sorry I haven't had a lot to post lately. Things are just kind of in down mode as far as cycling. I guess it is good for me right now. I have been commuting to work every day. Some of that story ends up over at the GreenvilleOnline.com cycling blog. So, it isn't as though I've stopped riding completely! Looks like the weather will be pretty good for Saturday, so I'm looking forward to getting out with the guys then. Here it is. I've replaced the tubes with presta valves and added a Specialized Body Geometry saddle. That's all I've done. Someday I might want to replace the wheels with something that stays a little better in true. The best addition is the mirror on the left bar. I put that on in honor of Art. It does help in traffic. 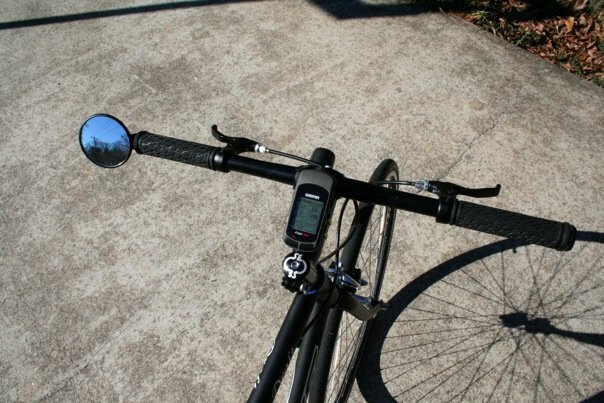 You can see I also added a mount for my Garmin. That was just for fun. And what wins the eye roll addition to the bike? My specially designed metal coffee container to help keep my coffee warm and safe on the way to the office. 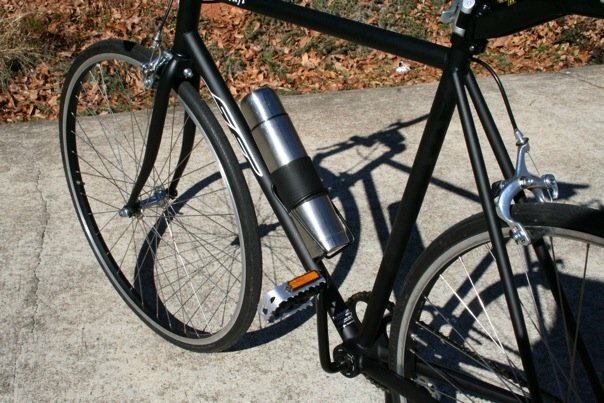 Here is the simple single speed system. I do find myself reaching my fingers for the shifters at times. That will pass at some point I'm sure.